By following production patterns approved sample is normally made for medium size but if the buyer requires different size then we would have to grade the dimension like S, L, XL, XXL, etc. 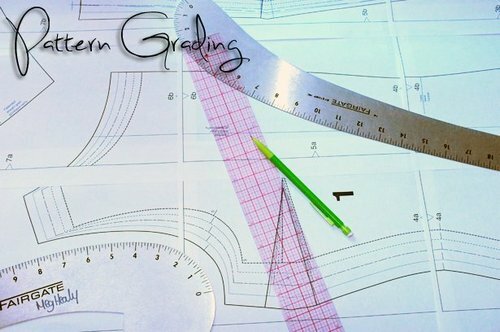 Grading is an important term in garments manufacturing which means step wise increasing or decreasing the master patterns. The desired range of size is created one by one using pattern templates/master patterns. A first master pattern pieces are sketched on the pattern board and then the points are marked around the pattern pieces as per the direction of grade rules. In this way we can get both the enlarged or reduced size patterns for all sizes of a particular style of garments. A manually operated grading machine can also perform this job. This device grips the master pattern pieces and places on the pattern board as per the predetermined direction after which appropriate edge can be traced out maintaining the grade rule. Expected accuracy may not be obtained. At first grade rules are stored in the computer memory and then the computer can automatically develop pattern sets for all sizes using the direction given in the grade chart. Half part grading: If the increasing is done in every sides of a pattern, then it called half part grading. ¼ th part grading: If the grading acquires increasing or decreasing in any two sides of a pattern, then it is called ¼ th part grading.